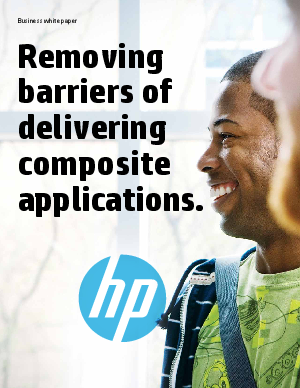 > HP > Removing barriers of delivering composite applications. Removing barriers of delivering composite applications. Today, everything is mobile, connected, interactive, immediate and fluid. To gain competitive advantage in the face of rapidly changing technology and business dynamics, enterprises must accelerate time to market. In an age of “instant” expectations, organizations have to be able to respond quickly and effectively to changing business needs. to deliver quality software on time and on budget. To do this rapid, agile development, many organizations are moving to composite applications which are made up of smaller units of functionality that can be developed and tested in quickly achieved increments. This approach promotes agility because the smaller units of functionality, or services, can be developed in parallel, accessed from third parties, and reused in multiple projects.